Giving property on lease is a common thing, and before leasing a property a contract has to be signed between the property owner and the person who is taking the property on lease. The property owner can terminate the lease contract at certain point of time, when conditions of contract have not been fulfilled by the person who has taken the property on lease. The property owner has to write an eviction letter to notify or request or even demand eviction. You can also see Employee Termination Letters. 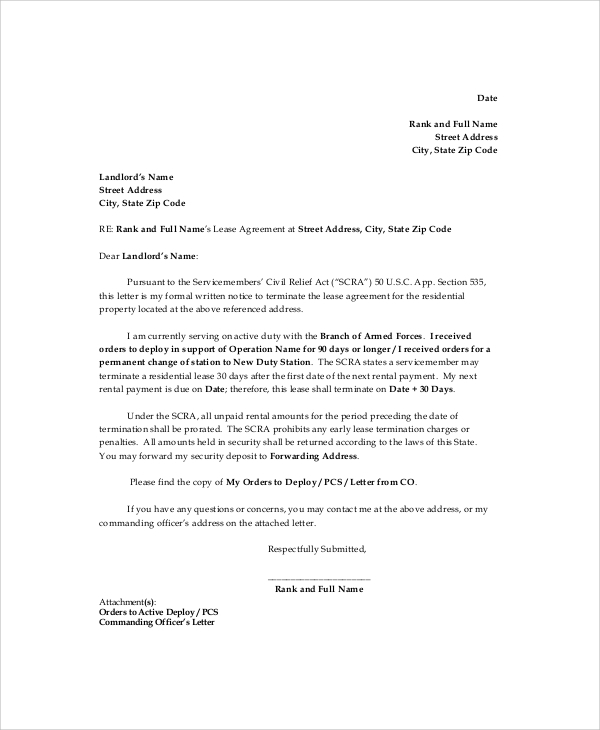 Lease agreement termination letter has to be written professionally, following the right format and tone of writing. It should elaborate the reasons behind contract termination, concisely. You can use this sample for that reason. 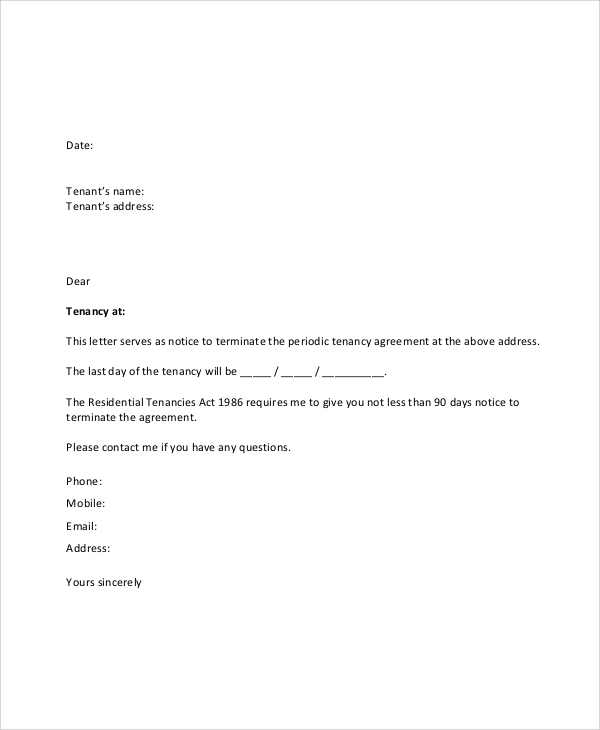 If you are looking for online examples for lease termination notice letter writing, you can consider checking this template or sample letter. Available in PDF file format, it is easy downloadable and can be customized also. 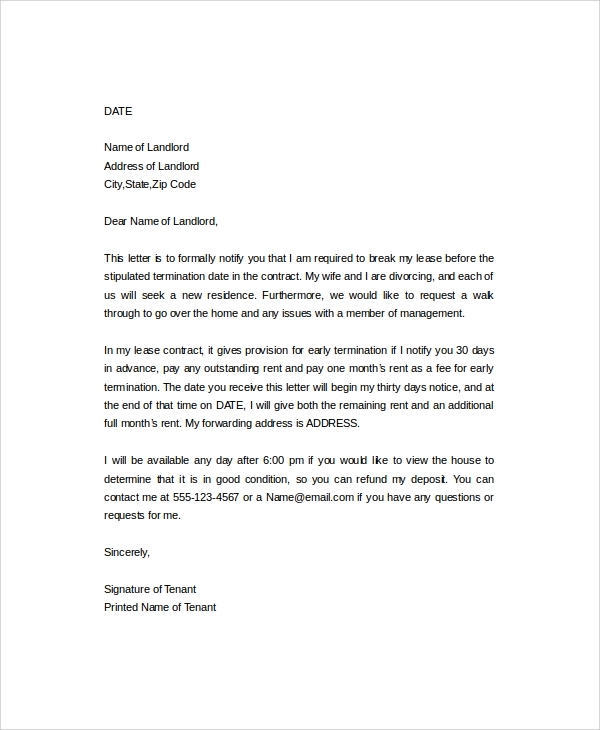 Owner of residential property has to write a formal and professional lease termination letter to the property renter for notifying eviction at the earliest. For that purpose, this template can be used. If you have rented an apartment on lease to someone, you also hold the right of termination of contract if you do not get the payments from the renter on time. Use this sample for writing letter of eviction. 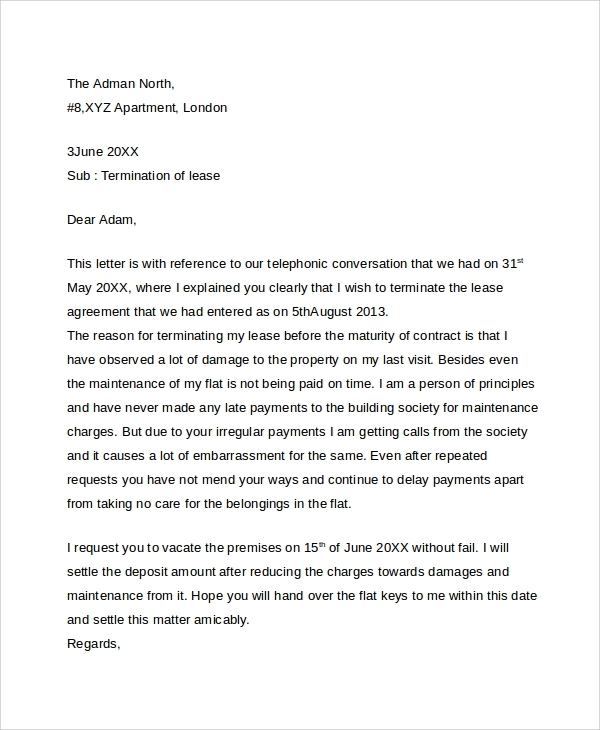 Lease termination letters are used for notifying on vacating the property in a formal way. Before giving a property on lease, a contract has been made between the property owner and lease seeker. The property owner holds the right to cancel or terminate the lease at any point of time, when contract conditions or terms have not been fulfilled by the person who possesses the property on lease at the moment. As per the contract, before lease termination, it is important that the property owner should formally notify the person who is living at the property right now. 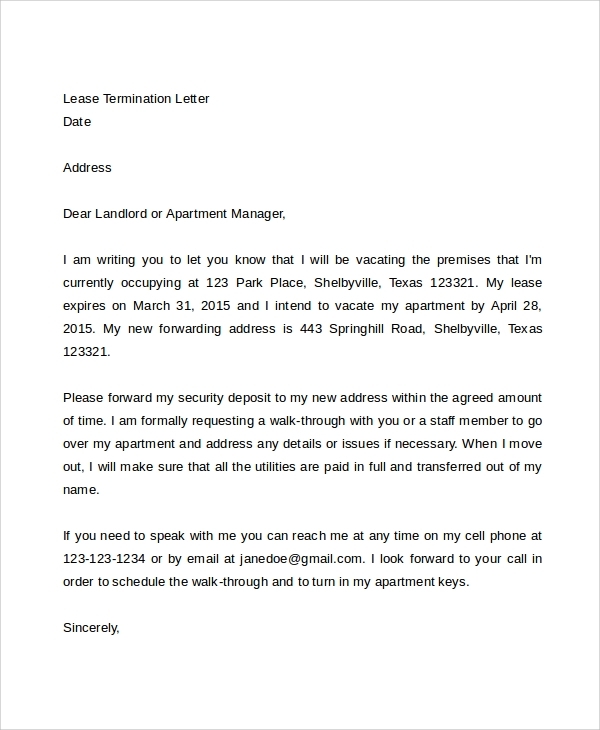 Lease termination letter serves as a formal notification from the property owner. Who Needs to Write Lease Termination Letters? Lease termination letter is considered as a formal notification from the property owner, to the person who has leased a property. The owners hold supreme rights on their properties, and after giving property on lease, they do not lose their rights on the property. Before leasing, a contract has to be signed between the two parties. In most of the contracts, owners are said to have the right to cancel the lease under certain circumstances. For example, payment as per agreement has not been disbursed causes dispute between the owner and the leaser. The owner can also cancel or terminate lease if the property has been used for unlawful activities. 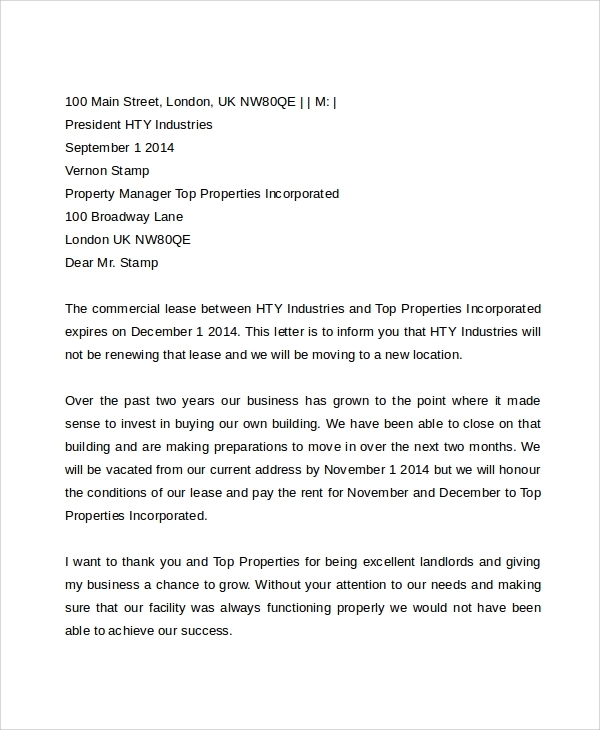 How to Write Lease Termination Letters? Lease termination or rental termination letter has to be written in a professional tone. It should maintain proper writing format. Like all formal letters, it too has some basic formatting rules to follow. However, the format is not complicated, and rather the format is more or less same like other professional or formal letters. The main part of the letter is concerned with the writing of the reasons for the requisition of eviction of property. The reasons should be logical, realistic, valid and worthy. If the reasons are falsified, the property leaser can take legal actions for unlawful eviction notice. 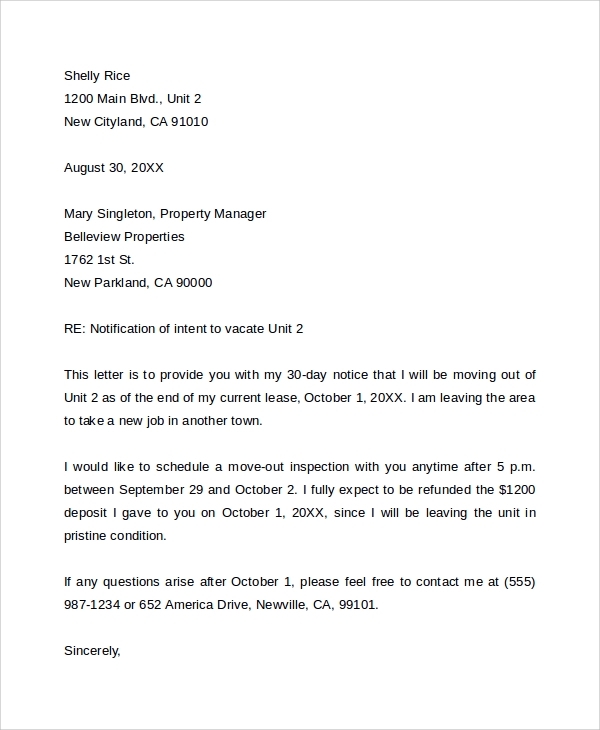 To write seamless eviction notice, online templates or samples can be used. Ideally, lease termination letter has to be written in professional tone. Since terminating a contract is a legal matter, the letter has to follow some guidelines or ethics. 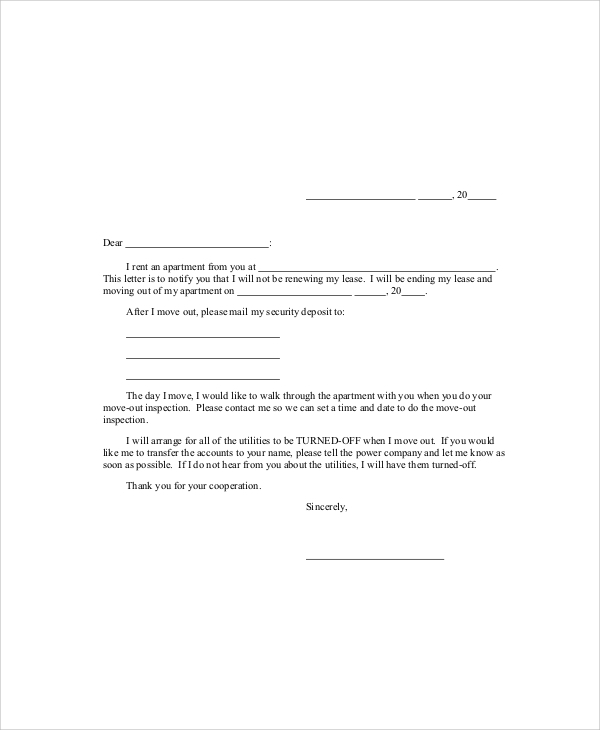 To write perfect lease termination agreement letters, finding online samples or templates can be the best thing to be done by property owners. You can also see Job Termination Letters.